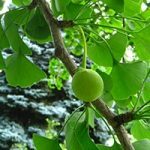 The maidenhair tree is a large tree from China, growing 30 m (100 ft) high (about 3 m in 10 years). The seeds, about the size of hazelnuts, are edible when roasted and an edible oil can be obtained from them; a popular food crop in China. The leaves are now used in modern medicine. Likes a position in full sun; dioecious (both sexes needed for fruiting) and hardy to -25°C.